I have a weakness for broths, pho and laksa. Seriously I dream about eating hot, steaming broths in road side cafes in some Asian country that has been lovingly created by the mama or papa of the household. My favourite eating experiences have been these low key affairs that are often quite unexpected. It’s the balance of sweet, sour, spicy and saltiness that gets me every time. I regularly try to replicate them here at home in London. The flavours, smells and textures take me to those foreign lands without the need for stepping foot on a plane. I guess that generally is the way I like to cook – foods from foreign lands that excite the taste buds and give you a warm inner happy glow. It sounds cheesy but it is so true. One of my mini me’s is a bit under the weather but has not lost her appetite so I said I would cook her a feast for lunch that would perk her up. Ok, it was kind of an excuse for me to have another broth pick-me-up too in all honesty. 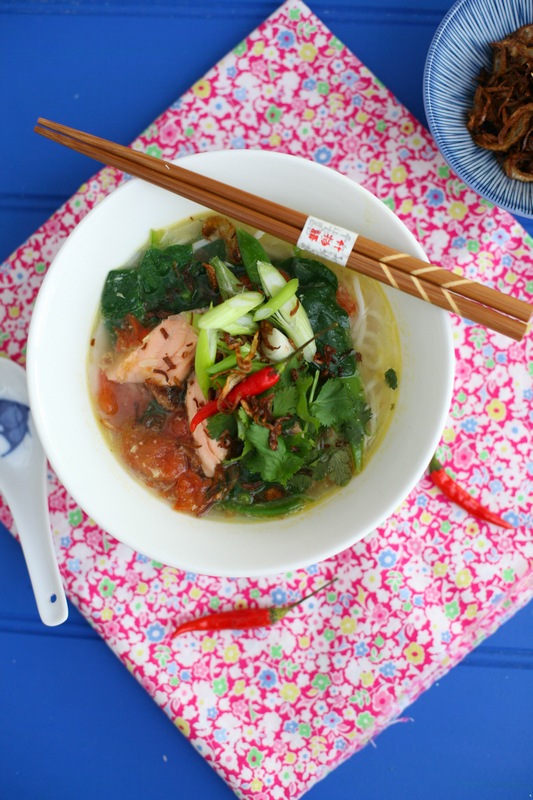 I decided to work with some big bold flavours such as the lemongrass, garlic and ginger and give them the centre stage in this dish. 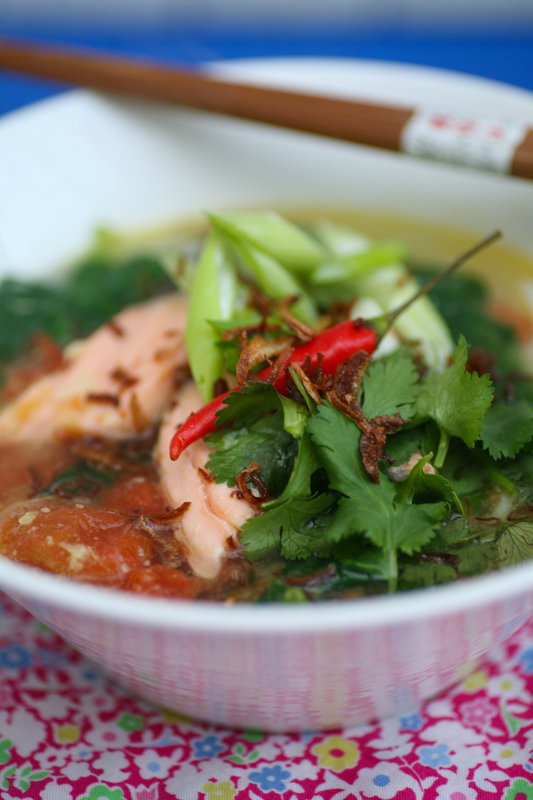 The sour came from the lime and kaffir lime leaves, the saltiness from the fish sauce and salmon, the sweetness from the tomatoes and a sprinkling of caster sugar and the spiciness (for me only) with the red chilli. I then added layers of crunch and flavour with the spring onions, fresh coriander and fried shallots. Instead of adding fish stock I added chicken stock which I think works far better for this type of dish. 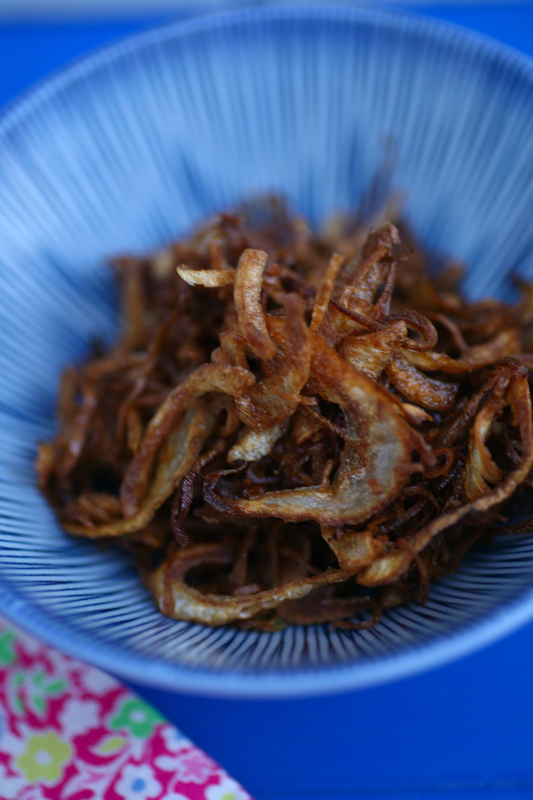 Crispy shallots are seriously addictive and add a wonderful crunch and flavour to the meal. I chose to add rice noodles that partly filled the bottom of my bowl and then added the broth on top. It wants to be 3/4 broth 1/4 noodles. Take a look at that close up. It’s making me hungry again just looking at. 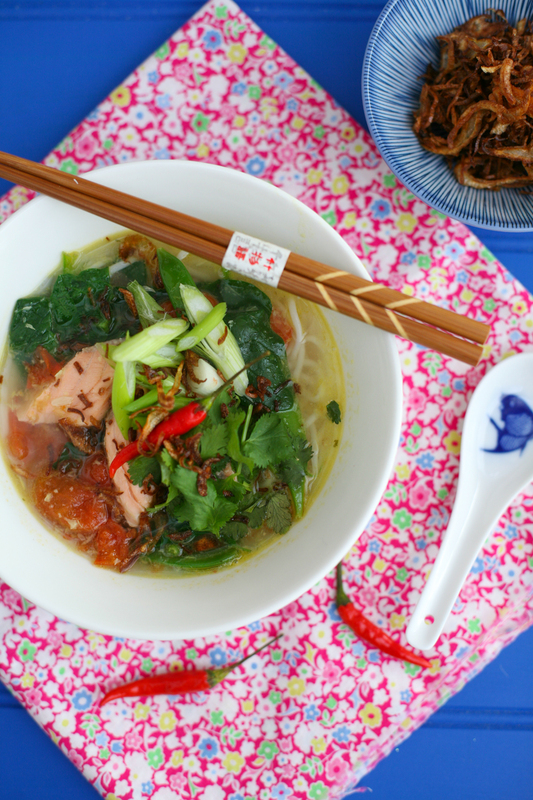 I adore fresh coriander and mouthfuls of that with the broth, sweet tomatoes, chilli, shallots and spring onions is absolutely sublime. Seriously you have to try it. You heard it hear first. Give it a go and let me know. My kids LOVE it so don’t presume that because it’s a little ‘exotic’ they won’t. I just leave out the chillies of course! 1. First warm a small pan with vegetable oil and heat. Add a small slither of shallot and if it fizzles it is ready to add the whole sliced shallot. Keep it at a high heat, but not so hot that they burn, and stir at intervals. After around 6 minutes the shallots will bronze and crisp up. At this stage remove them with a slotted spoon and place on a plate with kitchen paper to soak up the oil. 2. Place the ginger, garlic and lemongrass in a small blender and blend. Add 1 tablespoon of water and 1 tsp of oil and blend into a smooth (as possible) paste. 3. In a large, deep pan add some oil on a medium heat and then add the lemongrass paste and kaffir lime leaves and move around the pan for 2 minutes. Add the chicken stock, boiling water, fish sauce, lime juice and caster sugar and simmer for 10 minutes. 4. Cook the rice noodles according to the packet and place to one side. 5. A couple of minutes before serving add the fresh tomatoes, sugar snaps and spinach. 6. A minute before serving add the salmon so that it just cooks through completely but still holds together well. 7. 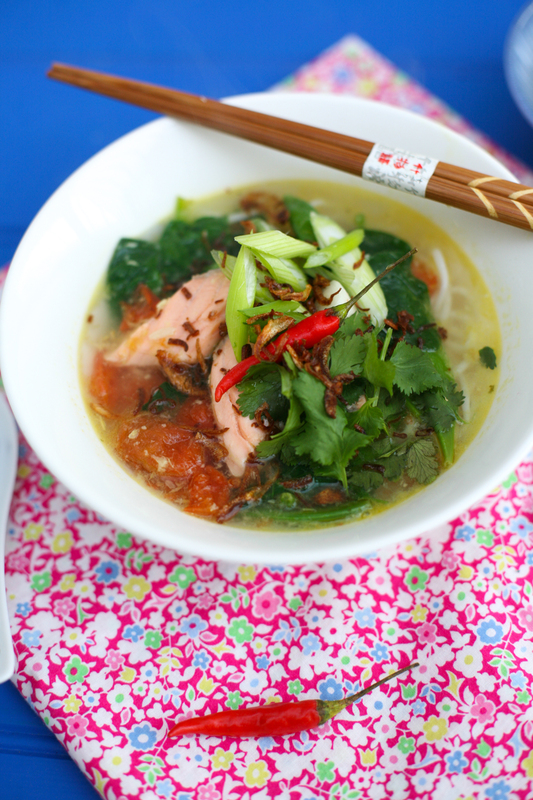 To serve place the noodles in a bowl followed by the broth, vegetables and salmon and then place the spring onion, fresh coriander, fried shallots and red chillies (if you need some extra heat) on top. Serve immediately with chopsticks and a spoon. 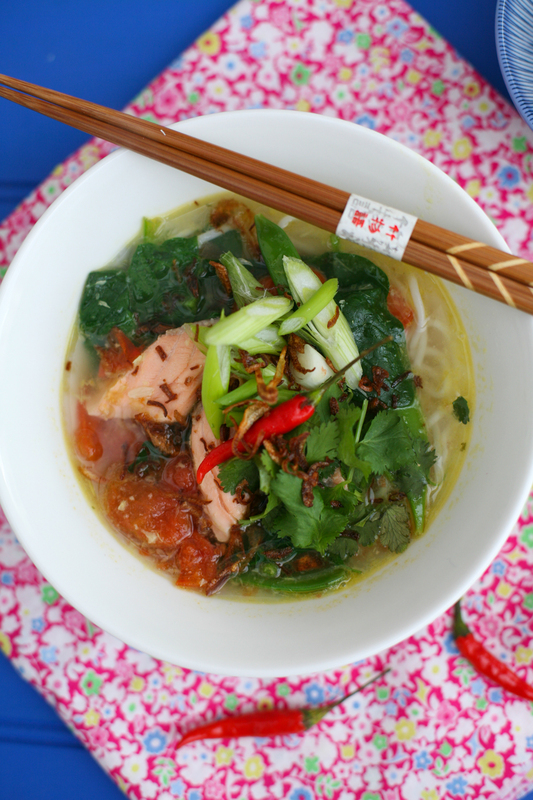 This entry was posted in Fish and tagged Asian, broth, easy, noodles, pho, quick, salmon. Bookmark the permalink. Yum – I shall be adding ingredients to my shopping list now! All very easy to get hold of – managed to pick them all up in Sainsbury’s. Perfect for this time of year when colds and coughs are commonplace. This is really beautiful and colorful! I’ve never heard of banana shallots. Are they a different shape? Yes, unlike your regular shallots that are rounder the banana shallots are the more elongated ones that look like mini bananas. I seem to always have them in my fridge. They last for ages. Thanks as ever for your lovely comments Mimi. Thanks Mary. Hope you and your crew like it, it’s a hit with my family. Enjoy the hols. This looks really delicious. 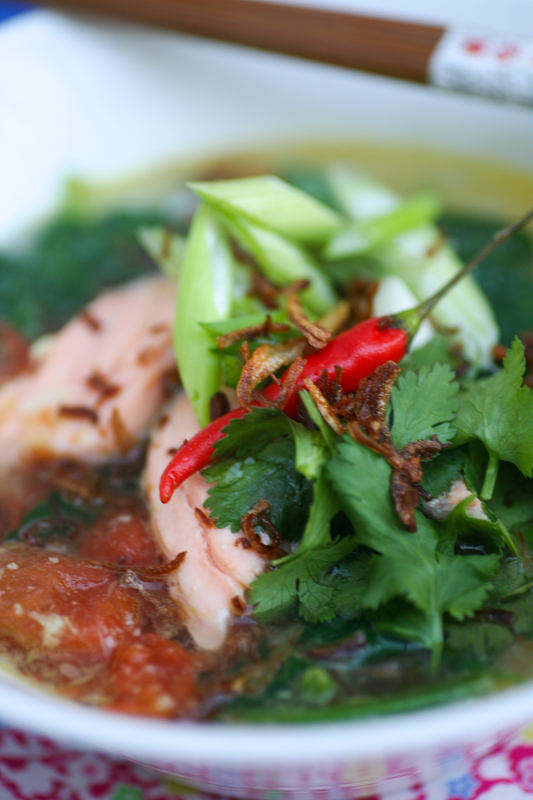 I am a fan of broth, fish chicken or meat. I am Starting to prepare to cook this. Thank you. Me too and a pure veggie broths are fabulous too. Rather obsessed with mushroom ramens at the moment. Hope you like my recipe.